A call to all our TWITTER members and to any of you who would like to sign up for Twitter just to help us as well, to send out an appeal for the moonbears who so desperately need your money. Here are mine and Elises TWEETS we did as examples. Be sure to mention ANIMALS ASIA in the post or this link http://animalsasia.org if there is room. Remember you only have 140 characters or less to state your case. Mission Moonbear supporter Elise Ney, told me about this opportunity the day it was announced. I had intended to post here earlier but “life happens” and haven’t had the chance till now…thank you Elise for your patience!! Actor Hugh Jackman has pledged to donate tens of thousands of pounds to charity in a Twitter contest. Users must send a 140-character “tweet” to the actor’s profile @RealHughJackman to nominate their cause. The star will give 100,000 Australian dollars – more than £48,000 – to the charity named by the best tweet. Hundreds of recession-hit charities are competing for the money as the economic downturn forces them to think of innovative ways to raise funds. Mr Jackman, who stars in Wolverine, told his online followers: “Your suggestions have been informative, touching and inspiring. MISSION MOONBEAR SPONSORS…BREAK OUT THE CHOCOLATE CIGARS! Hello, my friends and Mission Moonbear #3 members!!! I’m very proud to announce we have all our money collected for our special sponsored bear and to give you a sneak peek. His name is WILFRED… aka “Watermelon”. He got his name from the fact that all he would eat when he first was rescued was the sweet and tasty confection…. watermelon. 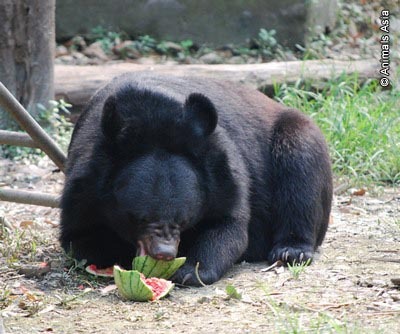 Above is a photo by Animals Asia as he arrived at AAF in his lifelong cage prison, having a taste of one of his many “first” pleasures in his new world…….fresh watermelon…..click the link to see how our boy Wilfred looks today and read his incredible story of survival!! Thank you all so very much for your kind and generous donations to help house and feed this beautiful blind moonbear. He is buddies with our previously adopted Mityan which is part of the reason I chose Wilfred for our group. I can’t wait to get to Chengdu to see these boys for myself again…especially now that I have names and stories to connect with each moonbear. THESE PHOTOS ARE PROOF POSITIVE THAT YOUR SPONSORSHIP DOLLARS ARE MAKING A DIFFERENCE IN EACH INDIVIDUAL LIFE OF THE ENDANGERED MOONBEARS. WHO WEAR THE CRESCENT MOON “SHIELD” OVER THEIR HEARTS! Luna Ursa Hugs and eternal thanks!!!! !